This spin-off from The Conjuring universe is about La Llorona, aka The Weeping Woman. She is a horrifying apparition, caught between Heaven and Hell, trapped in a terrible fate sealed by her own hand. The mere mention of her name has struck terror around the world for generations. In life, she drowned her children in a jealous rage, throwing herself in the churning river after them as she wept in pain. Now her tears are eternal. They are lethal, and those who hear her death call in the night are doomed. La Llorona creeps in the shadows and preys on the children, desperate to replace her own. As the centuries have passed, her desire has grown more voracious... and her methods more terrifying. In 1970s Los Angeles, she is stalking the night — and the children. 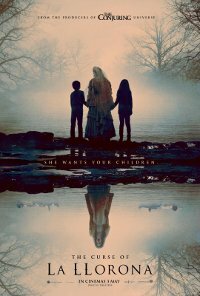 Ignoring the eerie warning of a troubled mother suspected of child endangerment, a social worker and her own small kids are soon drawn into a frightening supernatural realm. Their only hope to survive La Llorona’s deadly wrath may be a disillusioned priest and the mysticism he practices to keep evil at bay, on the fringes where fear and faith collide. Beware of her chilling wail... she will stop at nothing to lure you into the gloom. Because there is no peace for her anguish. There is no mercy for her soul. And there is no escape from the curse of La Llorona. Go get your own Cabbage Patch Kid!